Think beyond the nest egg . . . Do you know how you'll fund your retirement? With pensions slashed, savings slim, and Social Security insufficient and unpredictable, most people won't have nearly enough money to last them. But a sustainable solution lies in plain sight: rental property. Retire on Real Estate helps anyone, of any age, take advantage of this often overlooked income generator. 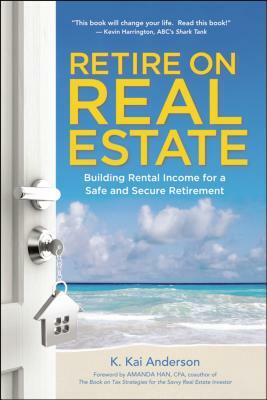 Written by a seasoned real estate investor and landlord, the book exposes the cracks in most retirement portfolios, opens your eyes to the benefits of rental income, and lays out a complete plan of action, including how to: Get started-by purchasing property or converting your residence into a rental * Reduce the risk of vacancies, repairs, and problem tenants * Calculate cash flow * Spot smart investments * Choose the right mortgage * Consider out-of-the-box financing options * Transform liabilities into assets * Stabilize your finances * Trade up to more profitable properties * And more Whether you want to diversify with a single property or self-fund your entire retirement, real estate is an investment that pays you back for the rest of your life. K. KAI ANDERSON, PH.D. is an experienced real estate investor and landlord. She has secured her retirement through rental properties and is on a mission to help others do the same. She is a graduate of the Investors United(TM) School of Real Estate Investing and holds advanced degrees from Johns Hopkins University.